Une maison spacieuse et familiale personnalisée convivial construit pour le divertissement. Cette maison familiale personnalisée est équipé de tout besoin d'une famille et désire pour l'ultime vacances Maine Summer. Planchers de bois récupérés, poutres, la cuisine d'un chef, (7) chambres, (7) et de salles de bains (2) demi-bains. Le sous-sol walk-out est entièrement équipée avec une barre de cuivre, table de ping-pong, salle de musculation et 80 "TV à écran plat. Il ya une place pour tout le monde dans cette maison, mais vous trouverez très probablement vos amis et famille installation à l'îlot de cuisine ou sur la magnifique véranda. Et dans les soirées de détente sur le quai à regarder le coucher du soleil ... le bonheur! We had an amazing time in Belgrade at this gorgeous home on the lake. Our family enjoyed active days on the water and beautiful sunsets. We spent most of our time using the kayaks, rented a motor boat and a sailboat and just sat on the huge dock soaking up the sun! The house was spectacular. Thank you Victoria!!! This home is absolutely amazing and was the perfect place for our vacation. We had three families (6 adults and 8 kids) and there was still room for more guests. Plenty of space to spread out but also great spaces for everyone to come together! The house itself is gorgeous with full baths for every bedroom (and the bedrooms are large with comfortable beds). The huge kitchen is perfect for cooking together and gathering as a group. There is a screened in porch overlooking the pond where we spent time drinking coffee in the morning and playing games/cards at night. The pond itself is clean, large and quiet. We were surprised how often we were the only ones out on the water. The dock was large enough to accommodate a large pontoon boat and a ski boat that we had rented. Victoria is fantastic to rent from...pleasant, responsive and attentive. I even got a text from the cleaners before we left to check in with us and then they sent my daughter's necklace to our home that she had left behind. Our only disappointment was having to leave at the end of our week! This could not have been more perfect. The house is large and comfortable and exquisitely crafted. The week we spent here was our first family vacation in five years. We love Maine, and this place is by far our favorite. We had extended family and friends come through at different times. The house’s 5 master suites gave everyone their own space to feel at home, which helped with the mixed crowd we had. That kitchen is awesome to cook in and there are tons of options for nearby places to find fresh/local produce and seafood. The weather was beautiful while we were there, and the lake was nice to swim in (mid-June) even for Florida kids. Given my decades-long affection for Maine, I expected to be underwhelmed a little as reality clashed with my time-seasoned memories about what I love up there. I could not have been more wrong. The beauty of that home inside and out, it’s place on Great Pond and the way it brings the outside in made it hard to leave. There is so much room, and different spaces, we were able to keep everyone happy whether they wanted to watch movies, play board games sit and read or play ping pong. ‘Truly a brilliant layout for a big family or multi-family vacation. ‘And the sunsets: the views on the dock in the evenings were incredible. With the cool temps, the loons, the breeze...Perfection. This home was the perfect back drop for our family vacation over the Summer. We flew into Portland, and spent the day on Main Street enjoying the local shopping, boutique stores and delicious food. Highly recommend stopping in at The Holy Donut - best donuts ever! Portland was an convenient airport to fly into and a easy drive to the home. The house is gorgeous. Beautiful traditional architecture, with a stunning kitchen, beautiful views, oversized fireplaces, and a huge family style dining table over looking the Lake. The Porch was our favorite place to spend time reading and drinking a morning coffee (plenty of coffee machine options in the kitchen for the coffee connoisseur). Watching the sun come up over the Lake, was the perfect peaceful start to our morning. The kitchen is a chef’s dream. Professional grade appliances, everything perfectly appointed. 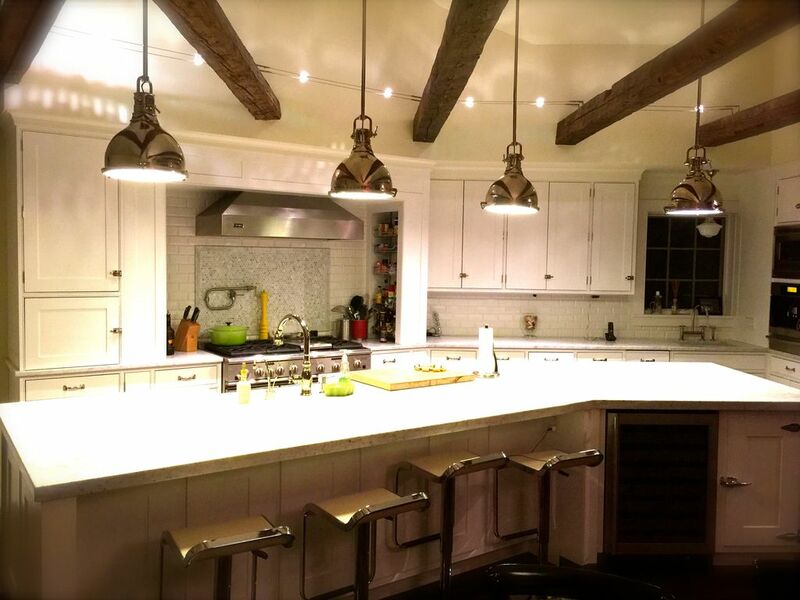 Gorgeous lighting and huge island for family and friends to gather around. Each room is lovely, with large windows and comfortable beds. Everyone commented on how comfortable the beds were, in each and every room. The bathrooms are large and well designed, with beautiful design details and elegant finishes. The bunk room was a super fun place for all of the kids to sleep. Quaint and comfortable, it was the perfect accomodation for our younger kids. The basement was a huge hit with our teens, who played hours of table tennis and stayed up all night watching TV. OK - it was a hit with the adults too! The property owners were so helpful; with recommendations on where to shop, what to eat, where to rent a boat. We spent every day on the Lake, fishing and boating, paddling and playing. The kids loved jumping from the dock and exploring the waters edge. The surrounding landscape is beautiful. The house is clearly well cared for and loved, and we would not hesitate to book this home again. It would make an incredible venue for family reunions (like ours) or wedding events alike. We took a day trip to the Acadia National Park - for more nature, hiking, beaches and beauty, and stopped in Bar Harbor - for more lobster and shopping. The National Park offers short and long hikes with incredible views and stunning scenery. Highly recommend making the trip! The owner and manager provide excellent customer service. They answered our questions before the trip when we were planning our adventures and were available during our stay to help us find whatever we needed. It's a beautiful, well-appointed home with an amazing kitchen! The setting for this property is idyllic, sitting up on a hill overlooking the lake, so peaceful and tranquil. When we arrived, the home was spotless and obviously maintained perfectly. We enjoyed our time there and as well as exploring the surrounding areas and the town. We plan to make this a destination vacation home often! Everything about this rental was just spectacular. We were a party of 15 and there was more then ample room for all to sleep. The rooms are just as they look in the photos on this site. The bathrooms are huge and graciously done. The kitchen held us all to eat our family meals. The lower level was great for all. Ping Pong, a bar, a gym. Nothing to be missed here. The views were spectacular in every room, you looked at "Snowy Pond". You awoke to nothing but solace and closed the night off with incredible sunsets. There was ample supplies of towels, sheets, and blankets. The home owners were just wonderful from the day 1 of booking it until we left and the caretaker is just amazing they even arranged the personal chef for us who was "perfect" . The best way to celebrate a Colby Graduation or any other special something with a large group. We will be back for the next one.